Joy, hope and a pooch smooch booth—a happy ending to a health scare. Thurs., March 20, 2015: Getting ready to go on vacation, Dr. Lucas’ biggest concern was looking great in her bikini. After work, she went for a run on her treadmill. As she finished, she bent over and felt pain between her shoulder blades. She shook it off, drank some water and went to bed. Fri., March 21: The next day was just as ordinary… woke up, ran four miles, went to work, went out to dinner and even went dancing. Sat., March 22: She couldn’t quite make it through her usual run. When she felt the urge to take a nap, paranoia set in. Could she be having a heart attack? She drove over to the vet clinic, checked her blood pressure and gave herself an EKG. Both were normal. Must be back problems. Sun., March 23: She was tired, but took her dogs up to Lake George. Then she headed to the gym to lift some weights. On the last set of the workout, she felt so much pressure around her neck that she fell off the machine. She got back on and finished the set, thinking it was nothing to worry about. Mon., March 24: She got on the elliptical for 30 minutes, had a glass of wine and went to bed. Tuesday, March 25: She woke up with the worst headache, so she scheduled an emergency session with her chiropractor, who also happens to be an EMT. He told her to go to the ER immediately; reluctantly, she did. Passing triage with flying colors, she went back to the waiting room. Three hours later, the ER doctor talked her into having a CT scan. When the scan was complete, she heard the doctor being paged, and medical personnel rushed to restrain her hands and arms: Even the slightest movement can cause an aortic aneurysm to rupture. As she was loaded onto the helicopter for transport to Albany Medical Center, she had only a 10 percent chance of survival. That evening, a cardiac surgeon performed a 12-hour surgery that saved her life. According to the American Heart Association, heart disease is the No. 1 killer of women. When AHA asked her to be a speaker and chair the Go Red For Women campaign, she immediately said yes. 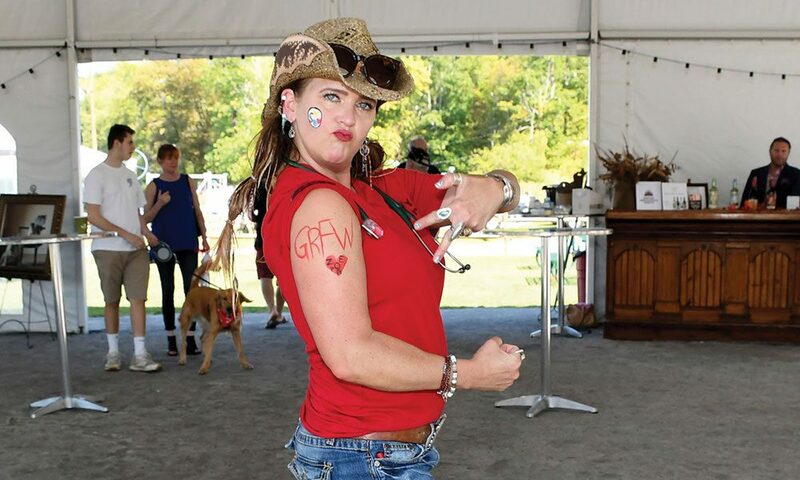 On Saturday, Sept. 23, Dr. Lucas and her friend, Hope Plavin — a brain aneurysm survivor — hosted Paws for Momma’s Heart, a fun, dog-friendly-event at Dock Brown’s Lakeside Tavern. The event featured healthy foods, massage, human and dog CPR instruction, and a Smooch the Pooch booth. For more information, visit heart.org and goredforwomen.org. Writer Molly Congdon lives in South Glens Falls. She’s a basketball junkie and drinks way too much coffee.